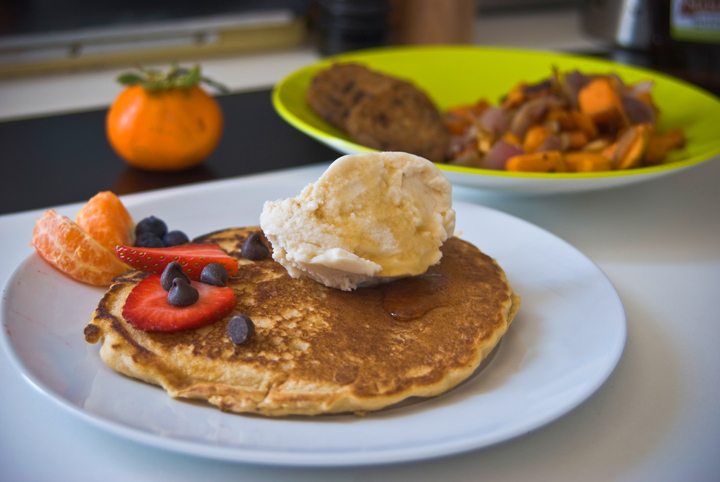 All Recipes « What the heck do vegans eat? Combine all ingredients. Add one of the limes directly to the apple slices so that they don't brown as quickly. Let marinate for at least 10 minutes before serving. Towel-dry and then press the tofu (wrap it in a towel, and put a skillet or a few books on top), for an hour if possible. While the tofu is being pressed, prepare the sauce (see sauce recipe a couple paragraphs down). Start boiling the water in one pan (once it boils, lower heat but maintain a simmer) and heating the oil in a skillet (for a couple minutes until it is hot, but not burning/smoking). 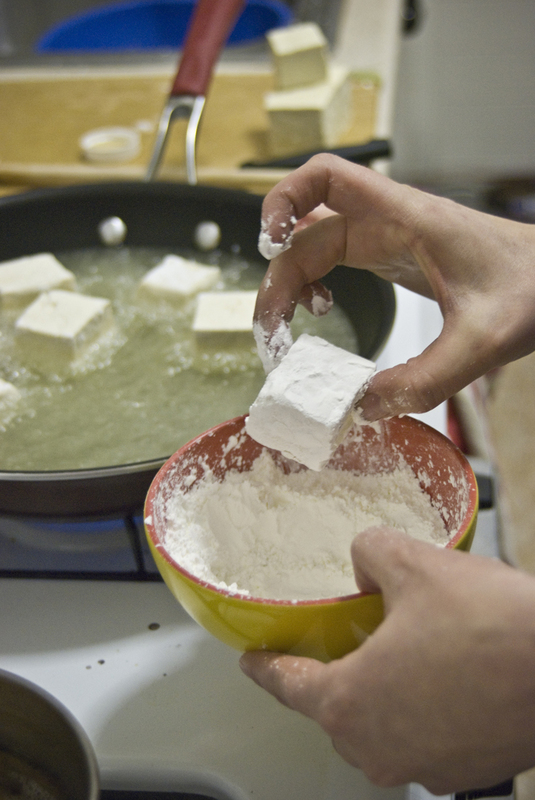 Cut the pressed tofu into large cubes (about a cubic inch). 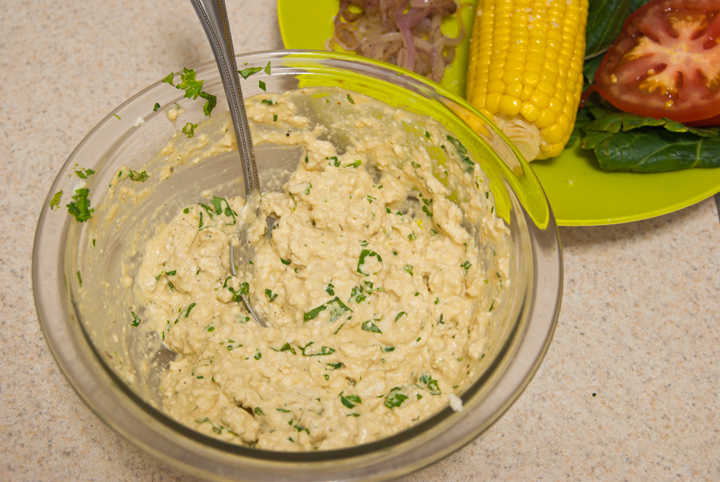 Dip the tofu into a small bowl with the corn starch, turning the tofu to thoroughly cover all sides. Place the starch-covered tofu in the hot oil and let fry for several minutes until the bottom starts to brown. Once it starts to brown, flip the tofu to cook the other side. While the second side cooks, pour the boiling water into a bowl. Once the tofu has browned on all sides, remove it from the oil and place in the hot water. 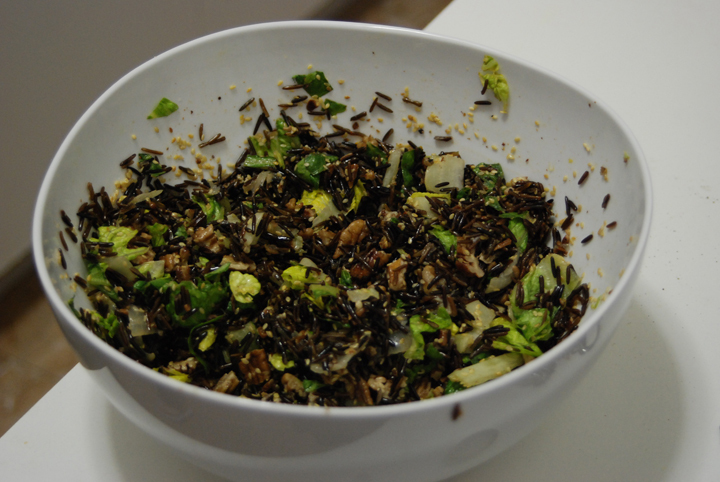 Then remove it from the water and place one side in a bowl with the sesame seeds to coat. Serve sesame-seed-side-up in a bowl with the sauce. boil water in a pot. in a separate bowl, mix miso with a couple tablespoons of the hot water, forming a paste; add the paste to the water (do it this way so it doesn't clump). add the rest of the ingredients, remove from heat, and let sit for a few minutes. This isn't really a recipe, as my aunt prepared the sauces and I do not have the recipes, but hopefully it will be a source of ideas for preparing vegan fondues. puree everything in a blender. 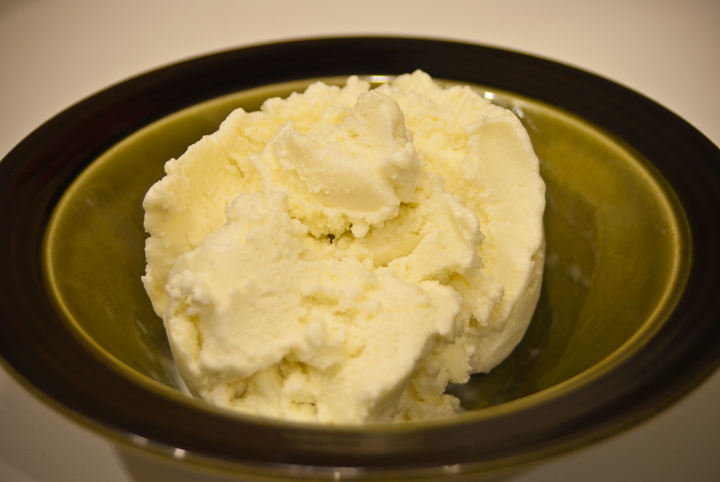 refrigerate for an hour or overnight, and then put in an ice cream maker and follow instructions. regardless of whether you actually make ice cream or not, the result is pretty amazing! Insert the garlic cloves in the eggplant. Do this by cutting into the eggplant skin with a small knife, and then pushing the garlic cloves in. If using big garlic cloves, cutting them in half will make this easier. Lightly coat the eggplant and a baking sheet with olive oil. Bake the eggplant with its garlic babies at 400F for about 30-35 minutes, until it is soft and the skin looks sort of gross and loose. Let the eggplant cool, or stick it in cold water if you're in a hurry. Peel the skin off. 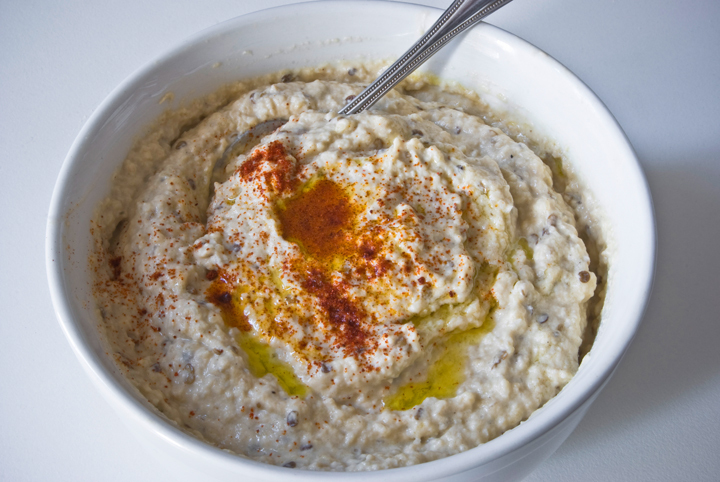 In sections there may be a tough layer beneath the skin; you can try blending this into the baba ghanoush, and if it won't blend you can remove it later. Food process the eggplant meat along with the roasted garlic cloves, tahini, lemon, sesame seeds, salt, pepper, and 1 T of olive oil. 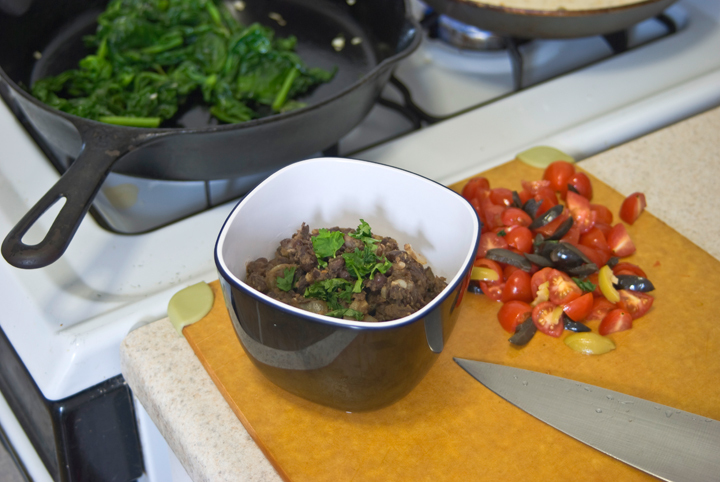 Once food processed, transfer to whatever bowl you want to store/serve in, and loosely mix in another 1/2 T olive oil. It is best to refrigerate for a couple hours before serving. Optionally, add another 1/2 T olive oil to the top, along with parsley, paprika, etc. Marinade for tofu: Dijon mustard, vinegar (I used apricot and lavender balsamic), olive oil, a dash of soy sauce, water, rosemary, thyme, red pepper flakes, salt, and pepper (all ingredients to taste). Since I was in a hurry and did not want to take time to soak the tofu in the marinade, I diluted the marinade with extra water so that it fully covered the tofu in a baking pan, and then cooked it 440F for 45 minutes (longer than is needed to cook well-marinated tofu). Add coarsely chopped red onion, shallot, and garlic 25 minutes before it is done baking. Add a layer of fresh spinach topped in vegan parmesan cheese (optional; available at Whole Foods) 10 minutes before it is done. combine flour through coconut in large bowl and bananas through oil in smaller bowl. add wet to dry and add apple juice as needed to just moisten the dry ingredients (don't overmix). fill 12 muffin tin compartments halfway, then add a slice of guava paste to each, and fill the rest of the way. bake ~22 minutes and let cool to the point that the guava oozes but doesn't burn your tongue! Combine dry ingredients. Cut in shortening. Once the shortening is distributed (mixture should resemble crumbs), add the soymilk. Toss on floured surface, and roll to about 1/2 inch thick. Cut circles (a drinking glass works well) of dough, and place on a greased cookie sheet. Bake at 450F for 10-12 minutes. Food process all ingredients. It is simplest to blend the garlic cloves first (to eliminate the need to mince them), to then add the next four ingredients and let mix (these more watery ingredients froth up and this seems to improve the texture), and to add the chickpeas at the end. Combine yeast with warm water and stir to dissolve. Let sit for a couple minutes, then add a splash of maple syrup. Let sit a few more minutes (you should see it start to froth up). Mix flour, salt, and seeds in a bowl. Add the yeast mixture, the rest of the maple syrup, oil, and water, and knead. Add enough water so that you can knead all the flour into the dough without the dough sticking to your hands (a little bit of sticking is okay after this first mixing). If the mixed dough is sticky, add a bit more flour; if it seems dry or if you can't knead all the flour in, add more water. After the dough is well mixed, spread a thin layer of olive oil on the surface of the dough, cover with a damp towel, and let rise at room temperature or warmer (a sunny windowsill is nice). After rising (as long as you want... about 45 minutes is good), punch the dough down and knead (about 10 minutes? Less if you knead like you need it). If it sticks to your hands, sprinkle whole wheat flour on the kneading surface and knead it in (repeat until it is no longer sticky). After kneading thoroughly, separate the dough into whatever loaves or rolls you are baking. Let rise like this for another 15 minutes or so (it will rise more in the oven). Bake at 425 until the outside is brown and it makes a hollow sound when hit (30-35minutes). Combine dry ingredients. Cut in Crisco. In a separate bowl, combine soymilk and cider vinegar to curdle; let this sit for 15 minutes. Then add the curdled soymilk to the rest of the ingredients, and stir. Roll to about 1/2 inch thick. Bake at 350F for 6-10 minutes (we took ours out too early, but it still tasted good) on a greased baking sheet. i used the cooking liquid from the black beans, but you could also just add water or, better yet, broth. saute the onion and celery with the herbs and spices for about 5 minutes. when the veggies are softened a bit but still a little crunchy, add the canned tomatoes and then throw the whole thing in with the beans and whatever liquid. bring to a simmer. salt and pepper to taste. while the soup is simmering, cut the tortillas into short thin strips and fry them in canola or veggie oil (you'll need quite a bit of oil). when they are brown, lift them out of the pan with a spatula, put them on a paper towel to soak up excess oil, and salt them. when the veggies are soft, take the soup off of the stove and let it cool for however long it needs in order to not explode in your blender. blend the soup until smooth (the best way is to blend the solid parts first and add liquid slowly). stir in the cilantro and green onions. garnish with the fried tortilla strips. Cook the rice sticks per directions (e.g., boil them in water with canola oil to prevent sticking, draining when done, about 10 minutes). While waiting for the rice sticks, prepare a broth by combining the dried shiitakes, lemongrass, bay leaves, cloves, black pepper, and boiling water. Stir a bit to help release the shiitake flavors. Let this steep aside. Also, while waiting for the rice sticks, saute the garlic and black beans in sesame+hot chili oil for a couple minutes on medium heat. When the rice sticks are finished cooking, set aside the beans+garlic, and saute the rice sticks in the same oiled pan for a few minutes, raising heat to medium-high, stirring constantly. (Separately sauteing the rice sticks and the garlic help each brown nicely.) Once the rice sticks have browned a bit on all sides, add back the beans+garlic, adding more oil if necessary. Let cook a couple more minutes, then add the vegetarian oyster sauce, corn, and black sesame seeds. Cook for a few more minutes, until it all seems like it is getting rather dry. Still on medium-high heat, add the broth, letting it sizzle and then stirring to incorporate. Turn the heat to low and let simmer in the broth. The beans should begin breaking down, a thicker sauce appearing. Continue simmering until the noodles have soaked up flavor, adding water to maintain a thick sauce. Add basil several minutes from the end, and lime at the very end of cooking. Saute the onion, garlic, carrot in olive oil with salt and pepper. Optional (to avoid mushy onion/garlic in the final product): after the onion, garlic, and any other vegetables are cooked, remove them from the heat and set aside. Mix them back in once the beans are finished cooking. I forgot about this so I left them in. Add the beans, along with the red pepper flakes, cumin, bay leaves, dried red peppers, and Old Bay. If you removed the sauteed onions and garlic to add at the end, you can add some quartered onion and large chunks of garlic to cook with the beans, which you can then remove before serving. After sauteing the beans and spices for a few minutes, add the bouillon. 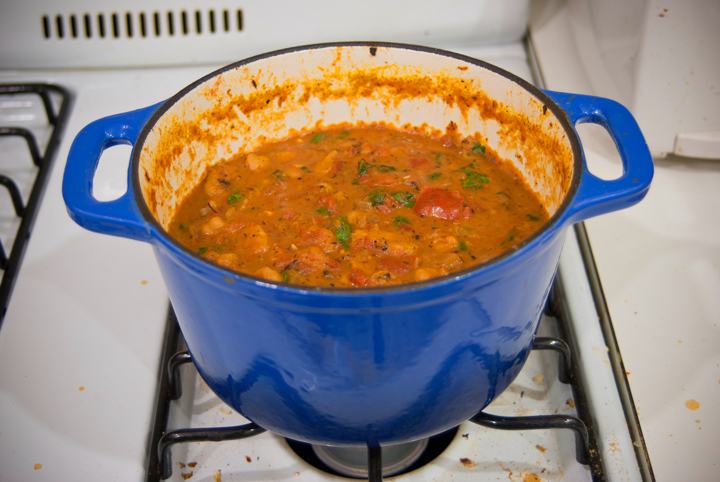 Heat on high until simmering, then reduce heat to a temperature that maintains a simmer. After at least half the water has evaporated (about 15-20 minutes? ), add the tomato paste. Cook for another 10 minutes or so, until most of the water has evaporated and the tomato paste has spread throughout the beans. If you removed the sauteed onion/garlic, remove any large onion/garlic that you boiled with the beans, and add the crunchier sauteed garlic and onion back. If you kept the garlic and onion in, embrace the mushiness. 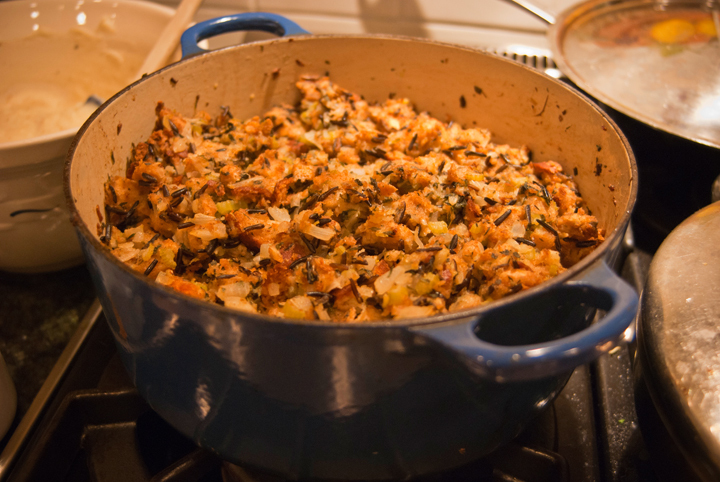 Toss the sauteed vegetables and the wild rice into the bread. Slowly add the broth to desired consistency, turning with a spoon to combine (a lifting/turning motion is better than vigorous stirring, which makes it too mushy). Don't add so much broth that there is unabsorbed broth at the bottom of the bowl, but don't be scared of it being pretty soft (I added the entire 3 cups for the type of bread I used). 1. Pre-heat oven to 325F. Prepare a 9 x 9 pan by greasing it and then lining it with parchment paper. 2. Sift together 1 1/2 cups flour, cocoa, 1 1/2 cups brown sugar, baking soda, baking powder and salt. 3. In a separate bowl, stir together the coffee, 2 teaspoon vanilla extract, 3/4 cup soy milk, and vegetable oil. 4. Combine the wet and dry mixes and stir well. Pour the batter into the prepared pan, and bake for 25 minutes, or until an inserted toothpick comes out clean. 5. Cool on a wire rack completely. In a large bowl, combine remaining 1/2 cup brown sugar, white sugar, and 1/2 cup margarine; beat until light and fluffy. Add remaining 2 tablespoons milk and 1 teaspoon vanilla; blend well. Lightly spoon remaining 1 cup flour into measuring cup. Add flour; mix well. Fold in 1 cup chocolate chips. Spread over cooled brownies. Refrigerate while preparing glaze. In the top of a double boiler or in a microwave-safe bowl, melt remaining 1 cup of chocolate chips and 1 tablespoons of oil, shortening, or margarine. Stir until completely melted and smooth. Carefully spoon over the cookie dough layer; spread evenly. Refrigerate for at least 30 minutes before cutting and serving. Thank you for taking the time to write and ask about Budweiser. Anheuser-Busch beers are brewed around the world using water, yeast, barley malt, hops and cereal grains (such as rice, corn, or sorghum). None of our Anheuser-Busch brewed beers or other products contain any animal ingredients (such as milk, eggs, etc), or process aids such as isinglass or gelatin, except for Michelob Honey Lager and Michelob Honey Wheat, which use real honey, and Budweiser and Bud Light Chelada, which contain Clamato. Stacey, thanks again for your interest. We hope that this information is helpful! Mix all ingredients except paprika in food processor. Once dished, sprinkle paprika on top. boil the cashews in the water or juice (i read that soaking overnight is good too). drain the cashews, reserving the cooking liquid. pulse the cashews in the blender with the agave and a dash of vanilla, adding some of the cooking water slowly, as necessary. Prepare crust using Crisco's double-pie-crust recipe, available here. Prepare crust, separating into two balls, one slightly bigger than the other for the crust base. Refrigerate until cold (at least thirty minutes). In a bowl, thoroughly stir all filling ingredients. Let sit for at least thirty minutes. Roll the bottom crust and press into greased pie pan. 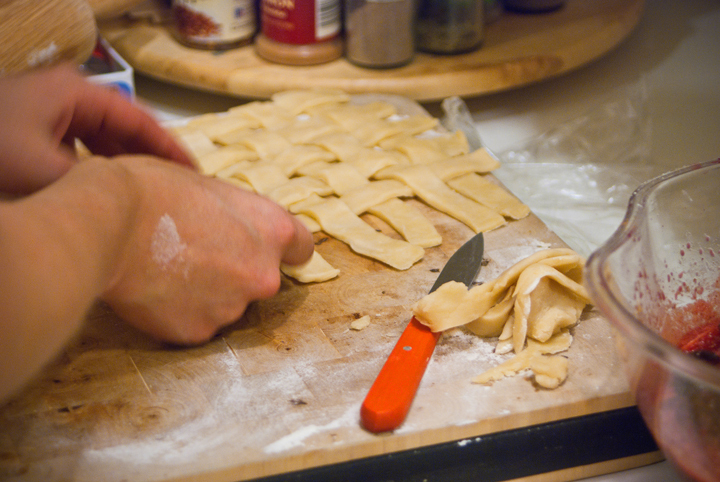 Roll the top crust, optionally cutting into strips to weave. Pour the filling into the bottom crust, then place the top crust on top of the filling. Pinch top to bottom of crust if you want (not necessary). Bake at 375F for about 60-70 minutes. 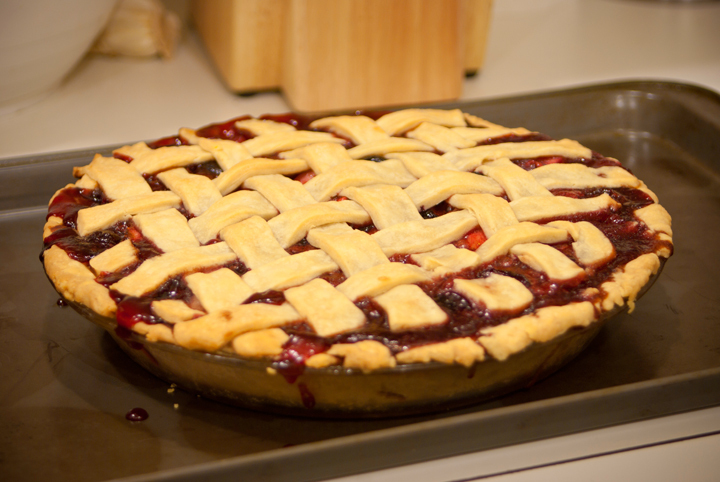 Place a cooking tray or aluminum foil beneath the pie to catch dripping pie filling. Let cool before serving. sautee the onion, carrot, celery, fennel, dried herbs and cumin partially covered until it's soft; add water or broth to cover and bring to a boil (we used water and it was fine). cook the noodles separately to al dente. add the tofu and noodles to the pot, and pour in the tamari (at some point i stopped and used salt; tamari's kind of expensive). when the soup is back to a simmer add the fresh parsley and corn starch which you have dissolved in cold water. Heat about 1 tsp canola oil in a frying pan on medium heat. Add 1/4-1/3 c batter, and cook 2-3 minutes on each side, flipping once bubbles have formed in the middle of the pancake and are starting to pop. I think next time I'm going to increase the water:flour ratio; they turned out too thick. mix together soy sauce, mustard and chipotle sauce. coat the tofu with the marinade. bake at 450 for 20 minutes. my tofu was cooked perfectly, but the pan burned. beat butter with sugar and brown sugar until creamy. add vanilla and tofu to wet mixture. blend dry mixture into creamed mixture. Adapted from a recipe on the back of a bag of Baker's semi-sweet chocolate chips that I saw in about 1990. Baker's semi-sweet chips are NOT vegan. Combine 2.25c flour (measured when flour is somewhat sifted or fluffy; do not pack the flour into the measuring cup), 1tsp baking soda, and 1tsp salt in a bowl. Set aside. Mix 1c softened Earth Balance, 0.75c granulated sugar, 0.75c packed brown sugar, and 2tsp vanilla in a bowl. Add replacement for 2 eggs. For egg replacement, I usually use a splash of soymilk roughly the volume of the missing egg white. 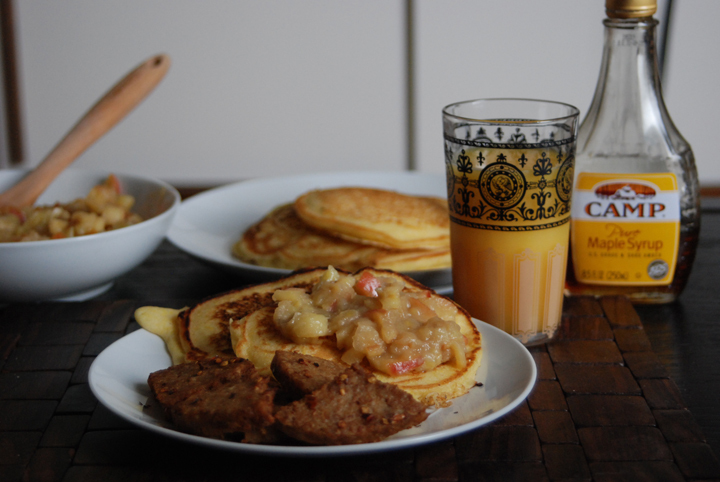 To replace the yolk, I add either a large spoonful of apple sauce, a quarter or half of a smashed brown banana, or a couple teaspoons of corn starch. The banana most affects the flavor, but this can be tasty, especially when combined with chocolate. With all three options, whisk the soymilk and the fake "yolk" with a fork before adding to the dough. Add the dry ingredients to the wet, and mix thoroughly. Add 10-12oz vegan semi-sweet chocolate chips (Ghirardelli is one easy-to-find brand). If you want to bake the cookies (not necessary), cook at 375ºF for about 10 minutes (until the edges just start to brown), turning the pan halfway through unless your oven has perfect heat distribution. we didn't have a bread pan (our pan was wider and shorter). we baked it for about 30 minutes until a knife came out clean. Mix the Earth Balance, sugars, and vanilla in a mixing bowl. In a separate small bowl, whisk the corn starch in the soymilk (this serves as replacement for the eggs), then mix into the mixing bowl. Once the wet ingredients are well mixed, mix in the dry ingredients (salt, baking soda, and flour). Then add chocolate chips. Bake at 350F for 12-14 minutes. mix wet and dry ingredients separately as per the usual. fold in rhubarb last. bake at 400ºF for about 25 min. Mix all ingredients together. Food process to add fluffiness. I intended on making parsley pesto, and then realized I didn't have enough parsley. I ended up liking it, particularly along with the hummus (very tart, which went well with the tahini-heavy hummus). Food process all ingredients.Blend the garlic cloves, carrot chunks, and nuts first so they are finely chopped, then add the next 5 ingredients, and finally add the parsley. salt the eggplant and set it aside in a colander. fry the ginger, mustard seeds, cumin seeds, and curry leaves in oil until mustard seeds start to pop. add the diced onion and chili flakes and cover. after a minute or two, add the sweet potatoes. when onions and sweet potatoes start to soften add the eggplant and spices; when eggplant softens add the tomatoes. let this stew until the tomatoes release their water; add more water if you want. add the coconut milk and simmer for several minutes until the vegetables are fully cooked; take off the heat and add lime juice, cilantro, and salt to taste. put a tablespoon or two of soymilk in a pot and heat until just boiling. stir in a handful or two of vegan chocolate chips until melted and smooth. adjust ratio of soymilk to chocolate chips to achieve desired pour- or spreadability. use immediately to pour over ice cream, let sit at room temp to form a spreadable frosting, or refrigerate for moldable consistency (e.g. to make chocolate truffles). I didn't measure anything when I made it; these are estimates. I'll try to remember to measure next time and update it, because I like how it turned out. Whisk together everything except the tofu and cilantro. Once thoroughly mixed, add the tofu and cilantro. Best served cold. adapted from this recipe, which is seriously awesome. Mix flour, sugar, baking powder together in a large bowl. Cut in Earth Balance (either with a knife or fork, or just by kneading it in with your hands). Prepare replacement for egg by whisking the corn starch with a splash of soy milk. Add this corn starch/soy milk mixture, the beer, and about 1c soy milk to the dry ingredients. Mix, leaving some clumps. Add the rest of the soy milk if necessary (depending on the thickness of the batter. it should be quite thin.) Add optional fruit or chocolate chips to batter. Heat a stick-free or well seasoned pan on medium-high heat. Once hot (dribbled water should sizzle), add 1/8-1/4 tsp Earth Balance. It should melt and sizzle quickly. Before it has spread out very far, scoop about 1/3c batter into the middle of the melting Earth Balance. Flip pancakes once most of the bubbles that form on top have popped. 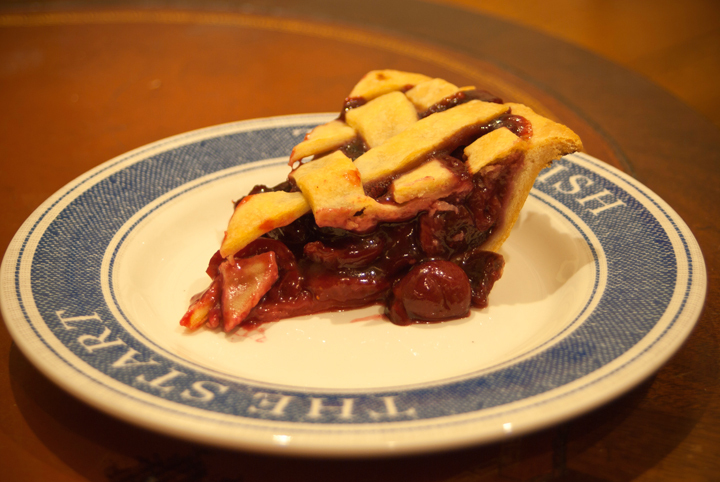 Serve with syrup, fresh sliced fruit, ice cream, or other toppings. in a small sauce pan, melt the earth balance. add the chocolate chips and ricemilk (i think i put a little too much ricemilk in and it turned out slightly runnier than i would like, although there's a lot of flexibility because it's going to be frozen anyhow). stir over medium-low heat until the chocolate chips are melted. turn the heat off. dip the bananas in the chocolate mix and roll them around, and then place them on a surface for freezing. i made a little boat out of tin foil and it worked great. after i rolled the bananas around and put them in my boat, i poured the rest of the chocolate mix on top, just so nothing went to waste. then i froze it for a couple hours and voila! it would be fun to put these on skewers and make them popsicles too. This recipe is totally made up. 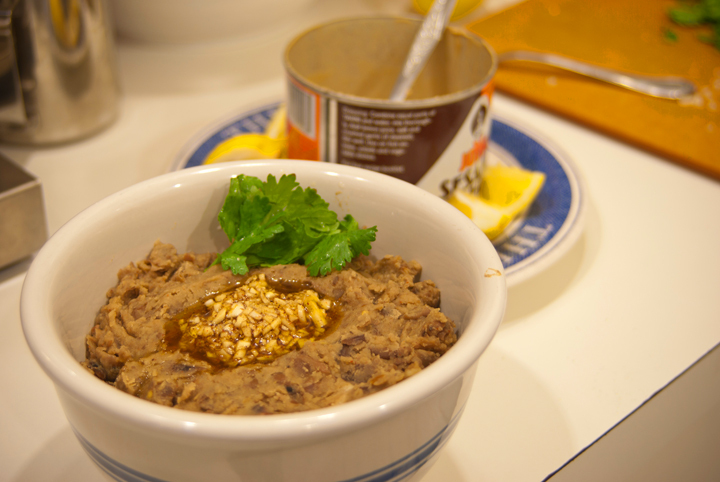 It would be better starting with dried beans so that they remain intact after cooking/flavoring. Combine the fava beans, bouillon, quartered onion, garlic, bay leaves, roasted red pepper flakes, black pepper, salt, and splash of olive oil in a saucepan. Bring to a boil, then reduce to a simmer. Cook, uncovered, until the bouillon reduces and you are left with a thick sauce. Some of the beans will disintegrate, but chunks of beans are okay. Once boiled down, remove onion, garlic, and bay leaves. Add cumin and chili powder to taste, and cook for a couple more minutes. Add more salt and pepper to taste if necessary. In a small bowl, combine the 1-2 T olive oil, about 1/2 tsp chili powder, about 1/2 tsp cumin, the minced garlic, and a dash of salt and pepper. Transfer ful to a serving dish, and create a little crater on the surface. Pour the olive oil/spice mixture into the crater. 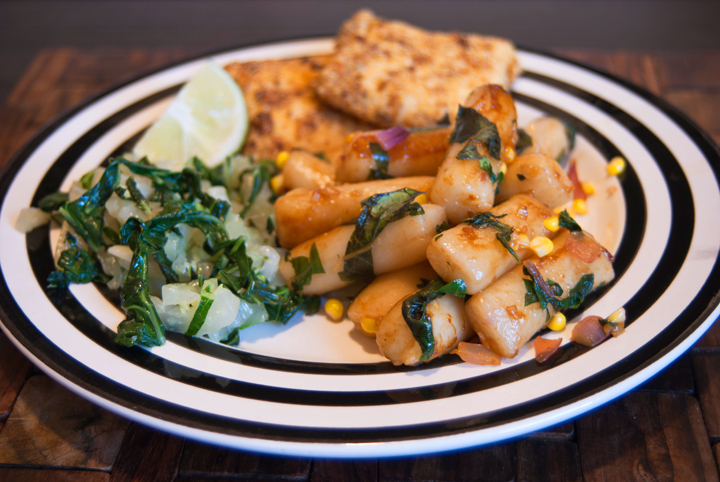 Serve with fresh lemon wedges and chopped cilantro or parsley. heat oil in a pan (i used canola because i wanted the garlic and ginger to get a little crispy). add the garlic and ginger, fry till brown, then add the onion. after a minute or two, season with cumin, oregano, whatever form of chile you've chosen, and some salt to help the onions sweat. cover, stirring occasionally, until onions are soft. add a little more oil if you want the dish to be a bit crispy, and then the rice, beans, and tomato paste. sautee uncovered until the tomato paste mellows out a bit, and add the lime and cilantro just before you take the dish off the heat. make 4 quarts of popcorn (about 1/2 c. kernels popped in 1/4 c. oil). dump the popcorn in a big paper bag along with a c. of peanuts. drizzle the oily mixture over the popcorn, then fold the bag over and shake until the popcorn is coated. (this may require whisking together more of the ingredients; use less oil than you think you need, because our popcorn turned out pretty oily, and it's okay if not every kernel is flavored.) then drizzle a tbsp or so of soy sauce, and shake again. spread the popcorn out on as many tin foil-covered baking sheets as you have; thin layers are better. bake for about 10 mins, until relatively dry. serve in a big bowl and make everybody guess what the ingredients are. pulse about 3 thumbs worth of ginger (or however much you can handle) in the food processor. add toasted sesame seeds and cashews, salt and agave to taste. add water until you achieve the consistency you want. serve on top of greens or pretty much anything. heat sesame oil in a medium sized pot. when it's hot, add the ginger and pepper flakes and stir until ginger is brown. add the onions and mushrooms; sautee until onions are soft and mushrooms release their liquid. add tamari and stir for a minute or two (i like the taste of tamari when it's been cooked or even burned a little, that's why i added it early). add the vegetable broth and then the miso. salt and pepper to taste. blend the tofu, milk, starch, molasses, and spices in a blender. pour into a flat bowl and soak each piece of bread for about 30 seconds on each side, then fry in oil until it looks like french toast is supposed to look. serve with whatever toppings are desired. Roast 1/2 coarsely chopped onion, 12 whole cloves garlic, crushed red pepper, salt, pepper, and olive oil for about 30 minutes. 10 minutes before done, add about 1c frozen green beans. Blend 1/4c toasted pine nuts, small handful of spinach, 1T lemon juice, 1T olive oil, dash of hot sauce (I used Sriracha), and contents of the roast. Add water to create desired texture (I added about 1/2c). Salt and pepper to taste. Serve over pasta, bread, etc. juice of one entire juicy lime. Use more limes if the lime is not very juicy. Fry tempeh strips (Lightlife's Smoky Tempeh Strips are amazing) in a scary amount of canola oil (enough oil to just cover the tempeh) on medium high heat. Afterwards, you can save the oil to use next time. 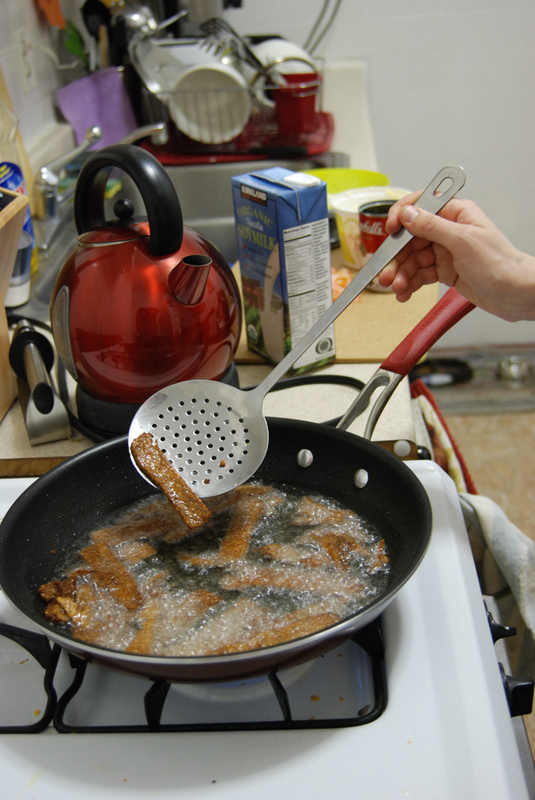 Try to flip the tempeh a few minutes into frying; takes about 5 minutes to cook, until they are just turning brown (they'll be a bit too crispy if you let them brown too much). To two pieces of white or sourdough bread, add Earth Balance to the outsides (to be grilled) and vegan mayonnaise to the inside (I used Spectrum Canola Oil spread). To the mayonnaise side of each slice of bread, add lettuce. 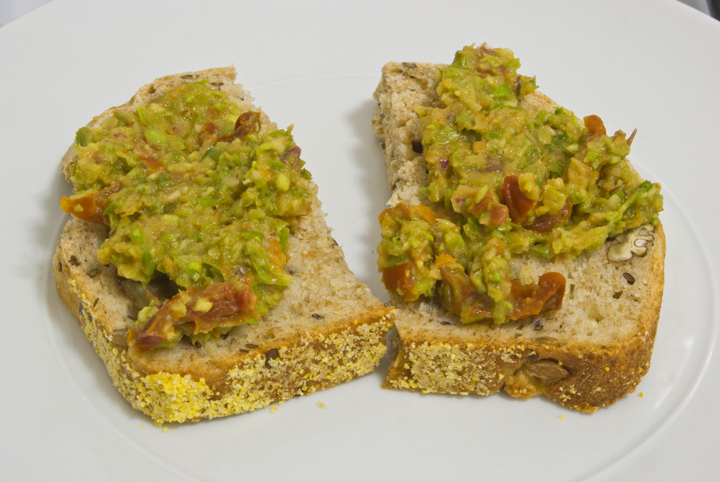 To one of the slices of bread, add a bunch of fried tempeh and a couple tomato slices. Grill the sandwich. Loosely adapted from 'vegan with a vengeance' and made to serve 2.
in a wide, flat bowl, whisk together 1/2 c. nondairy milk or creamer (i used so delicious coconut creamer in hazelnut flavor for extra hazelnuttiness) with 1 tbsp cornstarch. on a plate, spread out 1/4 c. hazelnut meal (make your own by toasting and food processor-ing a generous 1/4 c. raw hazelnuts). prepare a large skillet with a thin layer of canola oil, heated over medium heat until a drop of water sizzles on its surface. use 3-4 pieces of bread, dipping each one in the creamer to cover both sides, then in the hazelnut meal on each side so it's completely coated, before cooking in the pan 2-3 mins on each side, until golden brown. i served these topped with sliced bananas and "not-tella" from 'veganomicon'. in a large bowl, mix water, yeast, and sugar, and let sit until fragrant and foamy. add flour, salt, and herbs, and knead for 10 mins. oil the bowl and let sit, covered, until doubled in size. mix olive oil and garlic and set aside. punch down dough and stretch/flatten into a square baking pan (i did this to maximize the surface area on top, which will be covered with the garlic and seeds, but you could also use a loaf pan). score top of loaf. let rise again, covered, until doubled in size. meanwhile, preheat oven to 350. pour oil/garlic mix on top of loaf. sprinkle on the seeds and sea salt. bake 20 mins. Adapted from "The New Best Recipe" from the editors of Cooks Illustrated. 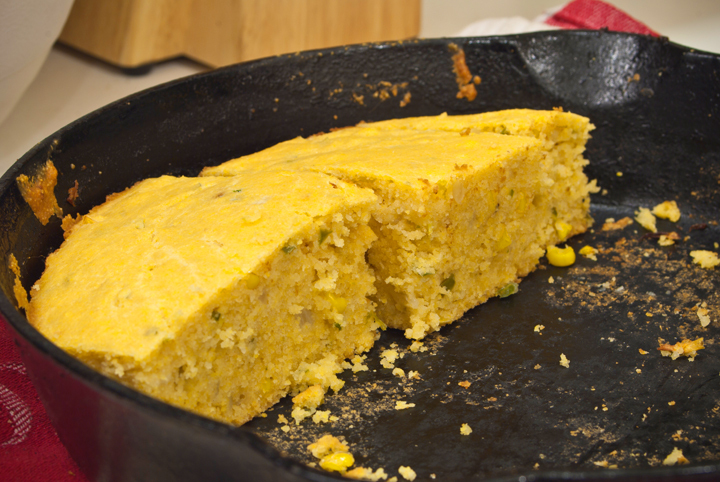 Heat 1T oil (corn or peanut work best) over medium-high heat in a large pan that doesn't tend to stick. Add 1 chopped onion and roasted red pepper flakes. Cook, stirring, until browned (about 8 min). Remove from the heat and set aside. Put roughly diced potatoes (about 1 pound) in a pot or saucepan, add 1tsp salt and enough water to cover potatoes, and place on high heat. As soon as the water starts boiling, drain. This method keeps the potatoes from getting mushy (something about starch). Heat another 1T oil plus 1T Earth balance on medium-high heat in the pan in which the onions were cooked. When the Earth Balance starts to foam, add potatoes and shake to distribute the oil all over the potatoes. Cook (avoiding turning) until the bottom side of the potatoes is browned (about 5 min). Turn the potatoes and cook, followed by several more turns over 10-15 minutes, until the potatoes are browned on at least several sides. When they are just about done, add the cooked onion, paprika, salt and pepper to taste. Cumin and cayenne pepper optional. directions: cut pita into triangles and brush with olive oil on both sides. coat both sides with spices, salt and pepper. We just threw a bunch of shakes of each spice. notes: start fermentation three days before you want to cook and eat the bread. bob's red mill makes teff flour (i've seen it in fiesta's health foods aisle), but if you are in chicago or another city with an ethiopian population, it's cheaper to buy it at an african grocery store (there are a couple near broadway and granville in chicago). this ended up being the perfect amount for 10 people, although we threw away quite a bit before achieving an edible outcome.mix 4 cups teff flour with 6 cups water, and stir in a packet of yeast. i used tap water at room temperature and rapid-rise yeast. cover with a towel and try not to disturb for three days. three days later, the mixture should smell yeasty and should bubble when agitated; ours even had tiny yeast colonies floating on the surface. the flour and liquid will have separated, so stir them back together. this is where the improvisations started. 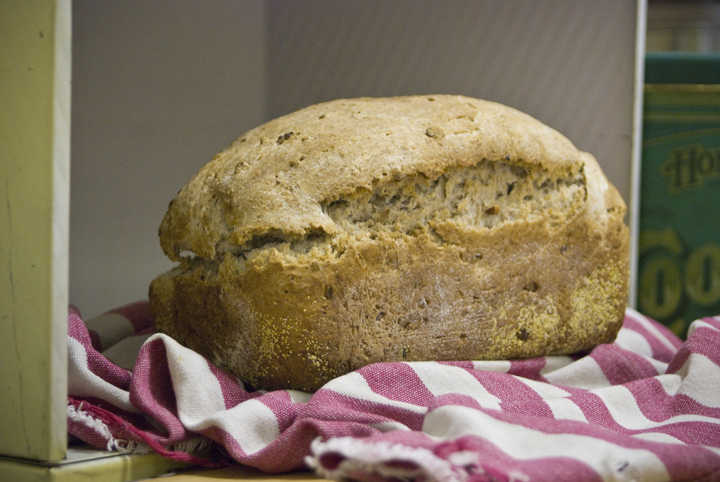 mix in 1-2 cups of whole wheat or whole spelt flour so that the bread will hold together. mix in about a tablespoon of baking soda for extra sponginess. let sit for a minute or two. meanwhile, lightly oil a crepe pan or cast iron skillet, and find a pot lid of the same circumference, that fits the pan well enough to trap some steam. heat the pan over medium heat until a drop of water dances on the surface. ladle enough batter to thinly cover the surface of the pan. cover the pan with the lid and let the bread cook/steam for a couple minutes, until bubbles start to show up on its top side. don't flip the bread, but remove it onto a plate and cover to keep warm. it's good to have a couple pans going at a time, or else this will take a while! Saute the onion and garlic with red pepper flakes, salt, and pepper, until just starting to brown. Use a small amount of olive oil to keep them from sticking, but not very much since you want them to start browning without cooking for too long (they'll have plenty of time to cook with the cous cous). 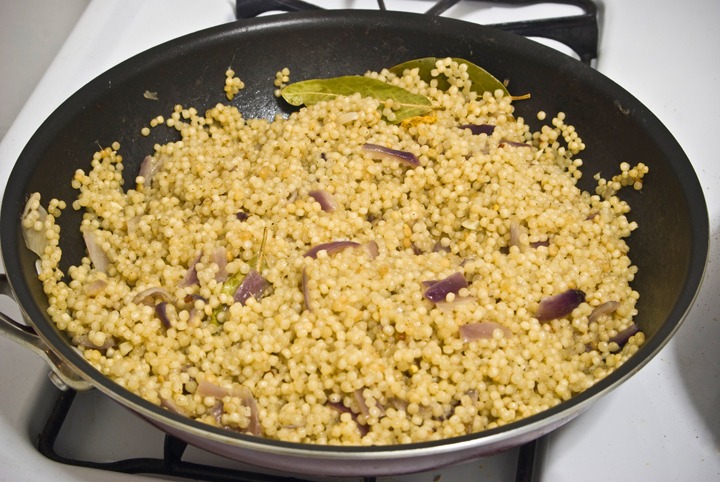 Add the cous cous, bay leaves, cinnamon, and a couple T Earth Balance, and saute for a few minutes. After the cous cous has toasted for a bit, add the broth, bring to a boil, and then reduce the heat to maintain a simmer. Cook until the broth has disappeared (about 15-20 minutes), turning a couple times to make sure that the cous cous on top gets cooked. Saute the garlic in olive oil for a minute or two. Add the rest of the ingredients. Saute for longer than you think on medium-high heat, stirring only enough to keep everything from burning. 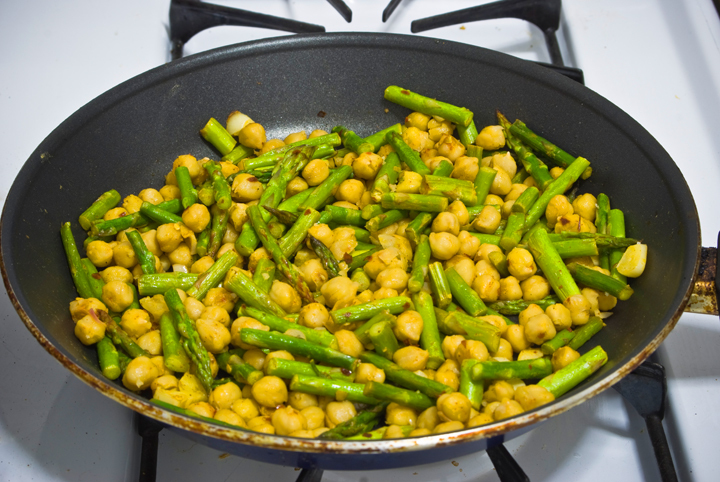 Chickpeas taste awesome if you cook them long enough for the outside to brown. I mixed the couscous, salad and dressing together and placed the baked tofu on top. Here is a picture of my dinner. Although Zack gave me his old digital camera I didn't have any charged batteries so I used my camera phone. Sorry they're a little blurry. Bake tofu and eggplant in the marinade at 400F for 80-90 minutes. Flip periodically. Drain (and save) most of the excess marinade. Add the tofu and eggplant to a Dutch oven, along with onion, garlic, thyme, chives + habañero pepper. Add about 1/2 cup of the excess marinade. Bake, covered, 10-20 minutes. Check periodically for dryness; if dry, baste with more marinade. When the onion and garlic are just about cooked, add the spinach to the top, cover, and let the spinach steam for a few minutes. Then stir in the spinach and cook a couple more minutes. 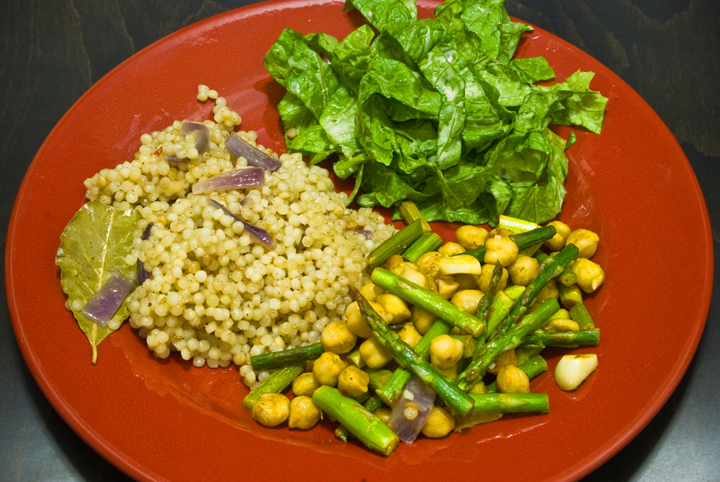 Separately, cook the Israeli couscous in 2:3 couscous:broth. If there is not enough broth, substitute water. Toast almonds in a pan and slice the radishes into think sticks. 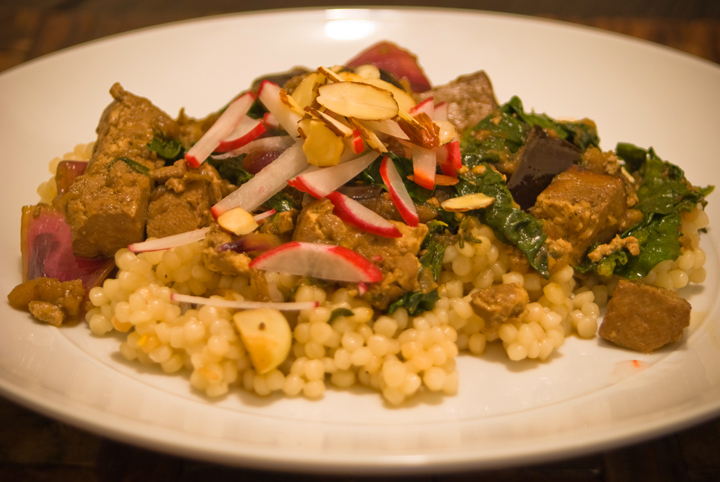 Serve the tofu/eggplant on top of the couscous, with the almonds, radishes, and freshly squeezed lemon on top. Preheat oven to 350F. Mix the soymilk and apple cider vinegar in a small bowl or measuring cup, and set aside, allowing to curdle. In a separate big bowl, mix the flour, corn meal, baking powder, 1 tsp salt, and sugar. Saute the onion and peppers on medium-high heat in 1 T oil with the dash of salt in a cast iron pan (any pan is fine if you don't have a cast iron) until slightly brown, about 5 minutes. Remove to a plate to cool. Saute the corn in same pan to let it brown a little, also about 5 minutes. Remove to the same plate to cool. After several minutes of cooling, add the vegetables to the dry ingredients. Mix in the Earth Balance into the dry ingredients with your hands, letting it get sort of clumpy. Add the soy yogurt in a similar fashion. Then, pour the 1 T remaining oil and the soymilk/vinegar combo into the bowl. Mix with a fork until combined, not overmixing (leave some clumps). Pour into the cast iron pan and bake for about 40 minutes. Mix flour, corn meal, sugar, baking powder together in a large bowl. Cut in Earth Balance (either with a knife or fork, or just by kneading it in with your hands). Prepare replacement for egg by whisking the corn starch with a splash of soy milk. Add this corn starch/soy milk mixture, the rest of the soy milk, and the lemon juice plus zest to the dry ingredients. Mix, leaving some clumps. Heat a stick-free or well seasoned pan on medium-high heat. Once hot (dribbled water should sizzle), add 1/8-1/4 tsp Earth Balance. It should melt and sizzle quickly. Before it has spread out very far, scoop about 1/3c batter into the middle of the melting Earth Balance. Flip pancakes once most of the bubbles that form on top have popped. cream together the sugars and earth balance until fluffy. add the yogurt and vanilla and mix. mix in the rest of the ingredients. make large cookies and bake for 12-14 minutes at 350. Cook about 1 c wild rice per instructions (typically 3:1 water: wild rice), with bay leaves, a dash olive oil, quartered onions, garlic chunks, red pepper flakes, salt, and pepper. While rice is cooking, chop about 2 c romaine lettuce. Dry roast 1 c pecans and 1/2 c sesame seeds with a bit of salt. Combine lettuce with pecans and seeds, and toss with the juice of 1 lemon. When rice is finished cooking, lay out on a plate or other dish to cool. Once cool, add to the lettuce/nut/seed/lemon mixture. Add a dash of olive oil, plus salt, pepper, and vinegar to taste (I used white balsamic vinegar). heat olive oil in a sauce pan. add the ginger and sage; cook until ginger begins to brown. add the carrot and onion. saute until both are soft. add the sauteed veggies to the lentils. vinegar, salt, and pepper to taste. Saute the onion and garlic in olive oil in a pot. 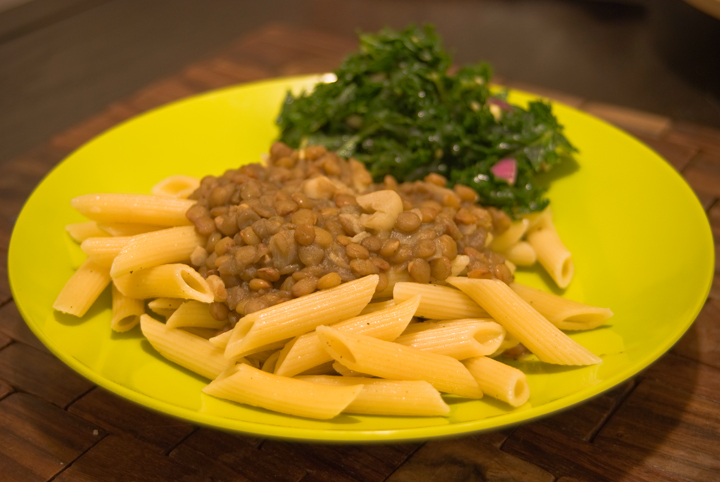 After a few minutes, add the lentils. Saute for another minute, then add the broth (or water + bouillon), black pepper, red pepper flakes, thyme, and bay leaves. Simmer until the lentils are cooked (about 40 minutes; could be much more or less depending on the lentils). Add more water if they start to stick to the bottom of the pan. Blend lychee (along with the syrup that comes with it) and coconut milk together in a food processor or blender. Add dash of salt and gin (to lower the freezing temperature, which helps it from being too icy according to Gershon). Insert into ice cream maker. Press "on." Takes at least 20 minutes since the mixture isn't pre-cooled. The lychee and coconut go very well together. I couldn't taste the gin, but I think it would also taste okay with the other flavors. make 4 quarts of popcorn (1/2 c. of kernels). pour over the popcorn and either shake in a paper bag or toss in a big bowl until evenly spread (not all kernels will be coated). bake on foil- or silicone-lined baking sheets for 7 mins. Cut tempeh into strips (I used a wild rice variety of tempeh from Lightlife), and spread in a single layer in a baking pan. Add quartered onions and large chunks of garlic. Choose a pan size that leaves little empty surface area once the tempeh is added. 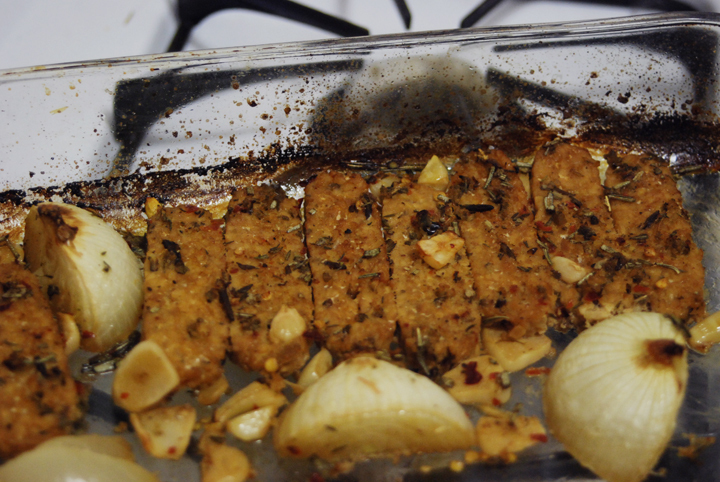 Pour the marinade over the tempeh (it should just submerge the tempeh). Bake at 425F until the marinade is soaked in and most of the water has evaporated (about 40 minutes). Eat as is, or in a sandwich. I had it on sourdough bread with lettuce and lemon wild rice salad as other sandwich fillings. toast the whole spices until fragrant, let cool 5 mins, and grind in spice/coffee bean grinder (along with new mexico chiles if using). mix in remaining. saute onion in oil until translucent. add garlic, ginger, saute 1 min. add berbere, stir. onions should be beginning to caramelize. add remaining, bring to boil, then simmer, uncovered, until lentils are soft and desired consistency is reached (longer for thicker). Sautee two small chopped yellow onions in a medium sized pot, with oil, until clear. Keep the pot covered while you do this to keep them nice and moist. Add 7 cloves of garlic cut into somewhat large chunks. About 5 minutes after adding garlic, add 1 can of black beans and 1 case of red kidney beans. Don't drain 'em. Keep that covered and cooking on medium heat. Now we are going to caramelize some sugar. In a separate pan, add 1/3C white sugar, and stir in enough water to make the whole thing a little soupy. Turn it on medium heat, and stir constantly with a wooden spoon until boiling. Make sure to scrape the sides if you get any buildup. Once it starts boiling, keep a close eye on it and wait for it to start to turn a brown color. When it does, stir it into the beans. Add a dash of cinnamon, Old Bay, hot sauce (we used sauce from a chipotle with adobo can), some crushed red pepper, and salt/pepper to taste. I am wondering if your beers are vegan.I do not use any ingredients derived from an animal including gelatin, milk, honey, whey, casein, isinglass, etc. I am interested both in the filtration process and in the ingredients that go into the beer itself. Thank you for your help. Reconstitute the wakame by covering it in warm water for about 15 minutes. Drain. Boil the water. Add bouillon and dried shiitake. After the bouillon is fully dissolved, add the tofu and simmer for 5 minutes. Add the miso paste, stirring to dissolve each tablespoon before adding the next tablespoon. Once all the miso is added, remove the shiitake (optional; I don't like the texture). Add the wakame. Simmer to keep warm until ready to eat. Just before serving, add green onions. saute the onions until soft. add the vegetable broth and bring to a simmer. when soup is hot, add asparagus, miso and tamari. throw the silken tofu in at the end. season to taste. soak 1/2 c of walnuts overnight. roast at 350 for 10 mins. in food processor, combine with 1/2 c water, 2 tbsp mellow white miso, 1 tbsp brown rice vinegar or lemon juice, 1 tbsp brown rice syrup, and an inch or so of chopped fresh ginger. pulse until creamy. Combine yeast with warm water and stir to dissolve. Let sit for a couple minutes, and add the splash of sugar (to help the yeast grow... does this really work?). Let sit a few more minutes (you should see it start to froth up). Mix flour, salt, seeds, nuts, and sugar in a bowl. Add the yeast mixture, oil, and water, and knead. Add enough water so that you can knead all the flour into the dough without the dough sticking to your hands (a little bit of sticking is okay after this first mixing). After it is fully mixed, if it is sticky, add a bit more flour; if it seems dry or if you can't knead all the flour in, add more water. Once mixed, spread a thin layer of olive oil on the surface of the dough, cover with a damp towel, and let rise (at room temperature or slightly warmer). Bake at 425 until the outside is browning and the loaves make a hollow sound when you hit them. The rolls I made took about 25 minutes, the loaf 30 minutes. Saute onion and garlic in olive oil. After a couple minutes, add the mushrooms. Season with black pepper and sage. When the mushrooms have just started to cook through, add the broth and simmer. In a separate pan, prepare a roux by heating and constantly stirring the Earth Balance and flour together over medium heat. After the two are mixed, they should start bubbling, and then start turning slightly brown. 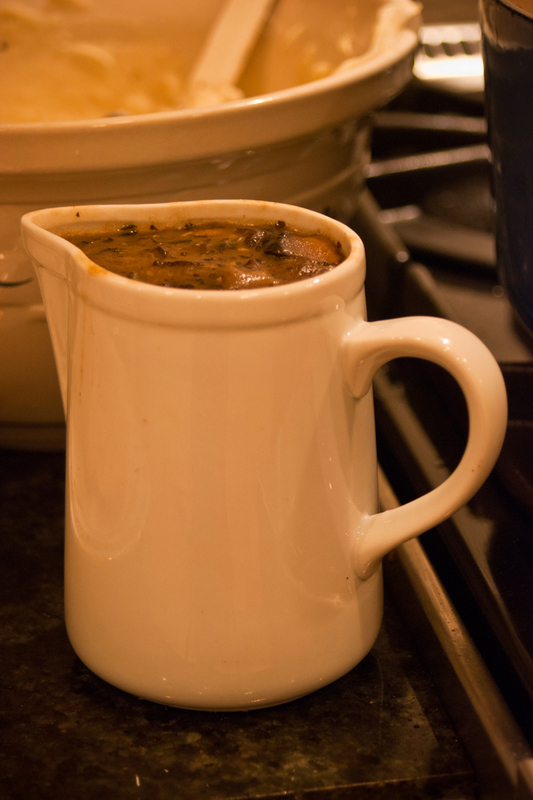 After cooking the roux for a couple minutes, add it (a bit at a time) to the gravy until desired thickness. Add salt if necessary. saute the mushrooms and garlic in olive oil until both are browned and most of the excess liquid has been soaked up. add to tomatoes and basil, s/p to taste. 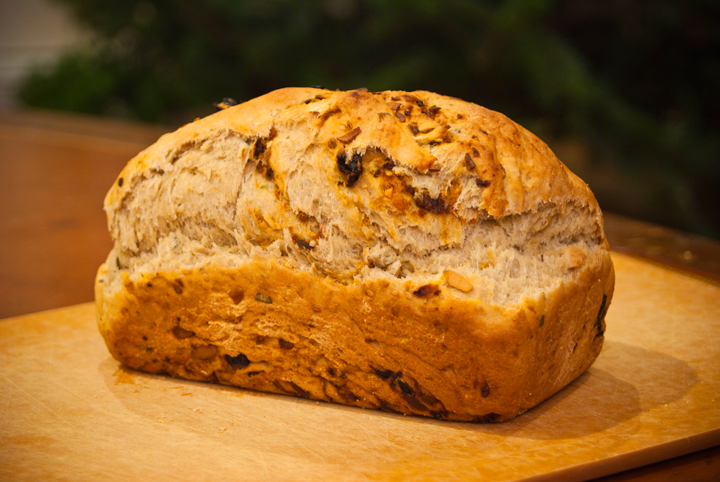 cut bread into thin slices, brush with olive oil, and brown in very warm oven (450?). put one on the other right before serving. toast and remove skins of 1 c. hazelnuts. blend in food processor until an oily, pasty mass forms (takes a little while). add 2 tbsp hazelnut liquor (frangelico), 1/4 tsp vanilla, 3/4 c. confectioner's sugar, 1/4 c. cocoa powder. then add soy milk until the desired consistency is achieved (less soy milk for spreading on toast, more for dipping fruit into, even more to pour over pancakes). the veganomicon recipe calls for soy milk powder and oil, so this version is a little less rich and fatty. 1) If using fresh okra wash and remove both ends; cut into small pieces. I used frozen okra2) boil a very small amount of water. if you are using fresh okra, add enough to cover the amount of okra cut. if you are using frozen okra, you need less water. if you use too much water, the dish will be watery and flavorless. 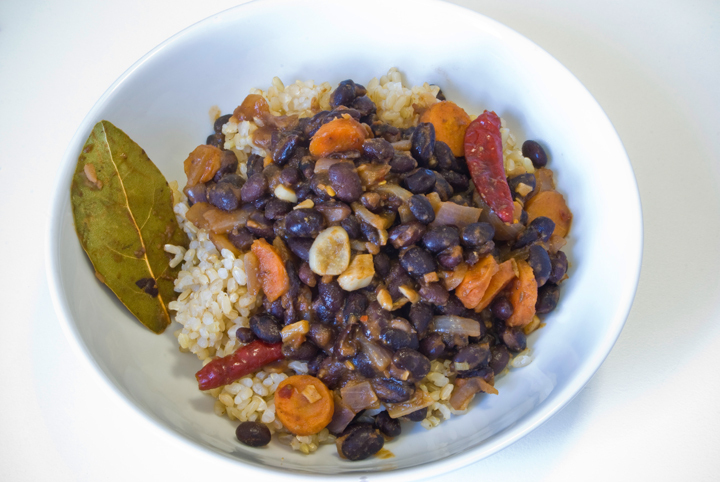 6) bring the stew back to a boil and continue to cook until it becomes thick and the seeds are cooked. Be sure to stir every once in awhile. make sure you do NOT cover the post during this step. if you do the liquid will boil over. 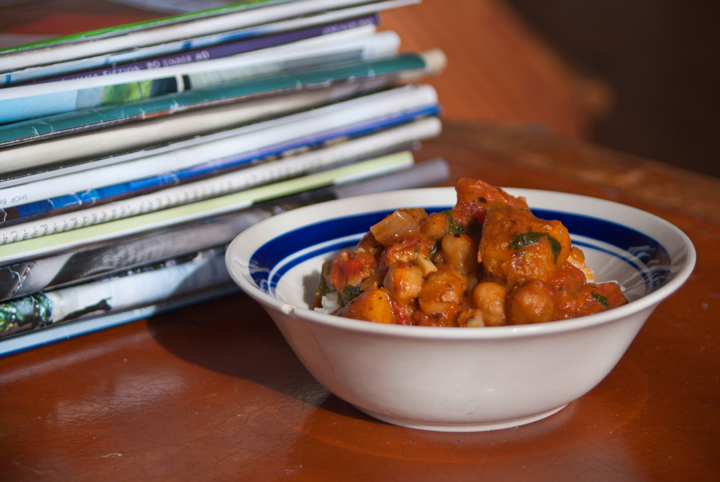 catherine and crispen eat this dish over sadza or add it to chili. I like to eat it over brown rice. i have never tried it in chili, but i hope to soon. Whisk 1/4 c coconut milk with the arrowroot powder. Heat the remaining coconut milk with sugar and salt on low heat until it boils. As soon as it boils, remove from heat and add the 1/4 c coconut milk + arrowroot. Stir; it should thicken. Let cool at room temperature for 20-30 minutes, then refrigerate until cool (at least a couple hours). Prepare according to ice cream maker's specifications, pouring in olive oil slowly and spaced throughout the churning. I don't have a recipe to share, but here is a list of what we included:saffron (thanks Shelley! ), bell pepers, garlic, onion, white rice, veggie broth, artichoke hearts, tomatoes, cumin, tumeric, chili flakes, paprika, chicken seasoning (doesn't actually have chicken in it), salt and pepper. saute the tofu separately in a nonstick pan until lightly browned and set aside. i added a bit of salt, pepper, turmeric, and dill to it for flavor and color. grind the chilis, ginger, water, and spices (except garam masala) in a food processor and add the mixture to hot oil. 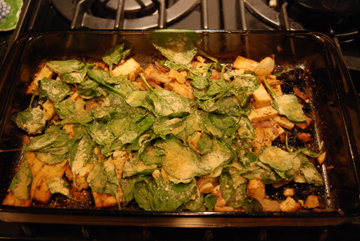 stuff in the spinach and cover; cook for 8 or so minutes. add the garam masala, salt, tofu and cream cheese and sautee for a few more minutes. overall i think you can never go wrong with two pounds of spinach, but if i did this recipe again i would probably double the spices, or better yet half the recipe aside from the spices, just because it made A TON OF FOOD and turned out a little bland. preheat to 375 and grease a baking sheet. in a large bowl, mix sugar, oil, and peanut butter thoroughly (by hand or with a mixer). add water, molasses, vanilla and mix. add flour, baking soda, salt and mix. fold in potato chips. form balls of 1 tbsp, and lightly flatten onto baking sheet with fingers. bake 9-11 minutes, until edges turn slightly brown. allow to cool. sautee the onions with herbs and spices. add the pumpkin puree. when the puree is cooked, add the veggie broth. when soup is hot, add the lime juice, sugar, coconut milk and cilantro. we were too lazy to blend this, but normally i would. Saute the onion, garlic, and potatoes in olive oil on medium-high heat for a few minutes. Add all the spices, the quinoa, and optional Bragg's, and saute for another minute or two so that the quinoa browns slightly. Then add the broth. Heat on high until boiling, then cover and reduce heat to medium-low (allowing a slight amount of vapor to escape, like with rice). Cook until the quinoa has absorbed all the water, adding more water if necessary (the amount of water varies based on how much vapor is escaping). Separately (you can do this beforehand), saute the mushrooms in a tiny bit of olive oil. 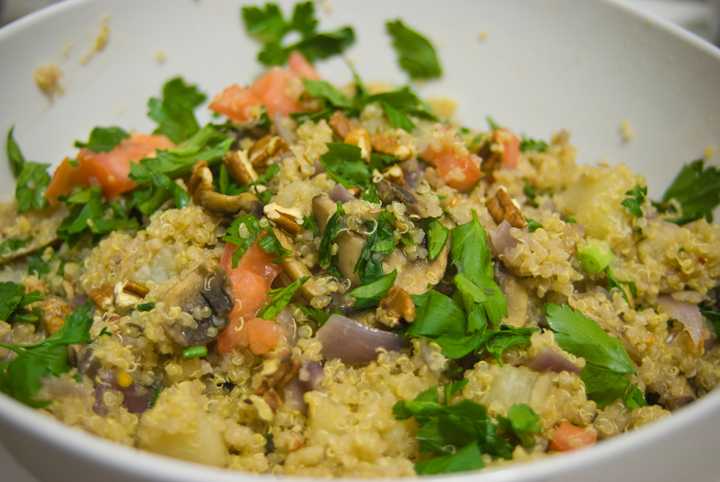 Toss/fluff the cooked quinoa with the mushrooms, parsley, walnuts, and tomato. Serve warm. While quinoa is cooking, saute the onion, garlic, bell pepper, and chipotle pepper in olive oil. Add the corn, and saute until the corn is starting to brown and has absorbed a bunch of the flavors. 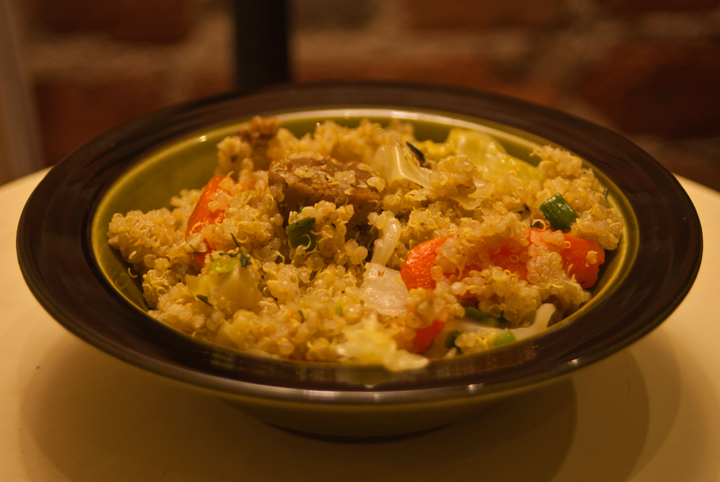 After quinoa is done cooking, let cool (transfer to shallow dish and refrigerate if you are in a hurry). 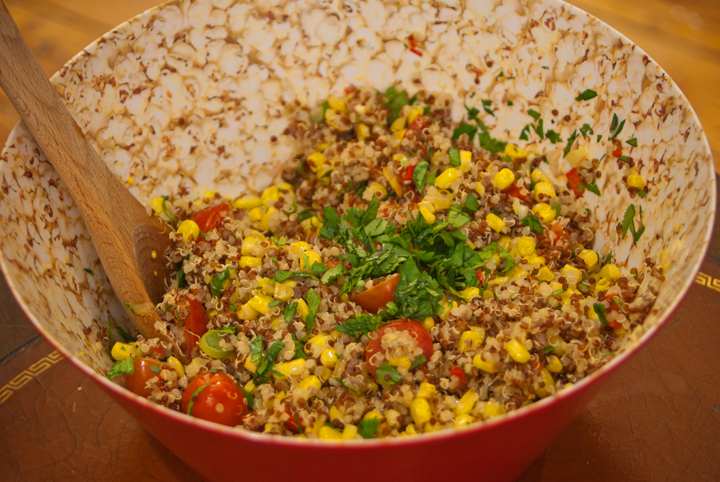 Toss the cooled quinoa and the sauteed vegetables in the olive oil, vinegar, lime juice, cherry tomatoes, green onions, and most of the cilantro. If you want to taste more chipotle, add straight adobo sauce from the can. Serve with the remaining cilantro sprinkled on top. 1 bunch kale, washed and chopped small. Spin to dry. 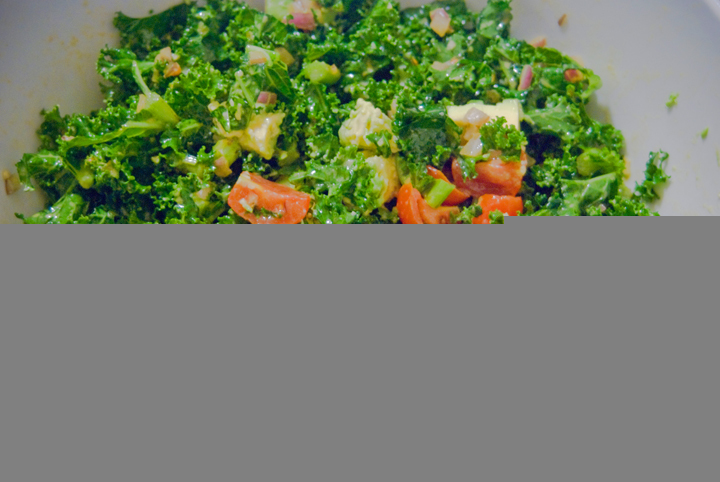 Toss kale in oil and Bragg's, and let marinate for at least ten minutes. Add onion, garlic, cherry tomatoes, and nutritional yeast, mixing thoroughly to incorporate the nutritional yeast. Add the avocado just before serving so that it doesn't brown. Saute the onion in canola oil on medium-high heat. After a couple minutes, add garlic, chipotle, and adobo sauce. After a couple more minutes, add the beans. Stir for a couple minutes, then mash the beans with a potato masher. Add the salt, pepper, cumin, and dill. Continue to fry, mixing in the water, for several minutes. 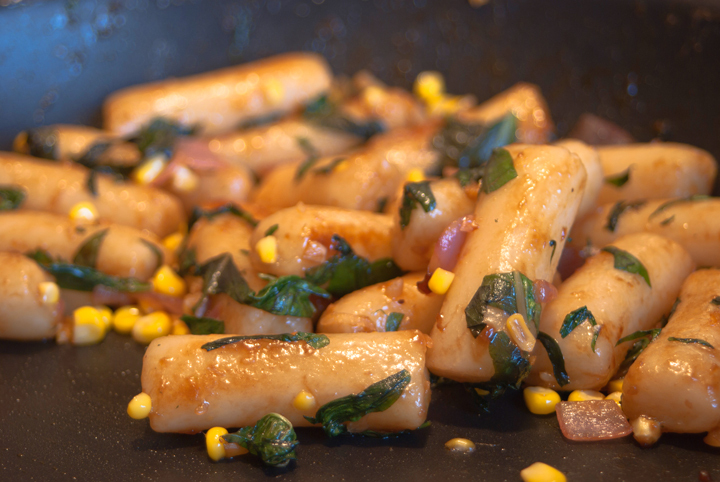 Serve with fresh cilantro on top. toss everything except the lemon juice in the olive oil and roast at 350, shaking things around once in a while. add the lemon juice after it comes out of the oven. rehydrate about 3 sun dried tomatoes by placing in a bowl of boiling water. while they soak, in a pan on the stove roast about 5 large unpeeled cloves of garlic until they blister on the outside and are soft on the inside. pulse the above ingredients in a food processor, adding water until a creamy texture is achieved. (this is my basic hummus recipe and to make plain hummus i would just add a clove or two of raw garlic and a generous pinch of paprika.) remove the garlic cloves from their peels and the sun dried tomatoes from their water and add both, pulsing to chop and distribute evenly. Mix dry ingredients. Add oil. Then slowly add broth. Remove husks from corn on the cob. Spread a big spoonful of filling over about half of the length of the husk (about 3-4 inches). The filling should take up about 3/4 of the width of the husk, leaving clean 1/4 of the width along one edge. Roll that clean 1/4 edge under the filling, width-wise, creating the bottom of the tamale. Then roll the tamale lengthwise. This is backwards of what tamales are supposed to be, but if you have the constraints of husks off the cob or of a shallow saucepan, it works. 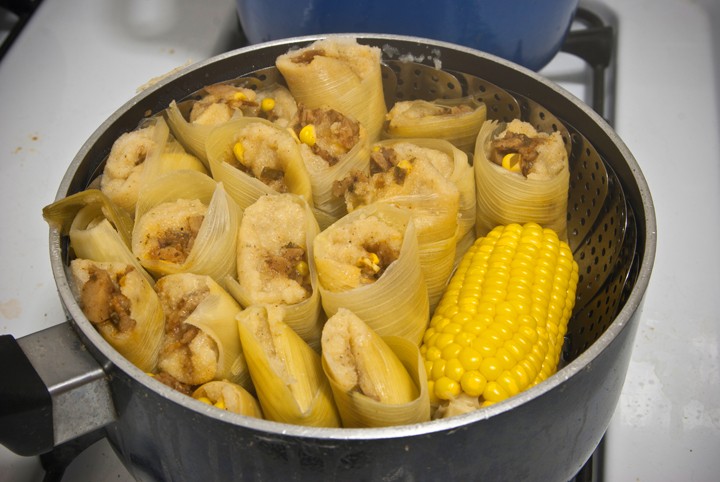 Prop tamales upright (rolled edge downward, exposed filling upwards) in a pan for steaming, not letting them unravel. This is a bit difficult; use drinking glasses or other objects to prop them up as you continue to prep. If you run out of husks or dough without filling the entire pan, insert an object that can withstand steaming. Corn on the cob chunks work well. This recipe is a work in progress as I ended up with too much sauce and had to remove a lot of it in the middle of the process. 3 small blocks tofu, cut into %C2%A1triangles! Mix the soy sauce and water in a shallow pan, and add the cut tofu (the tofu drained/pressed as much as you have time for), letting it marinate for a few minutes while the next steps are performed. Mix the peanut butter, sesame oil, lime, agave, ginger, garlic, black pepper, and red pepper flakes in a small bowl. Saute this mixture in a saucepan for a minute or two (to let the garlic and ginger start to cook). Then add the tofu with soy sauce, tossing so that the tofu is totally coated in the sauce. Fry for several minutes, letting the coat brown and even start to turn a little black. I ended up with too much sauce, and if this happens, you can transfer the tofu to a new pan and save the excess sauce. 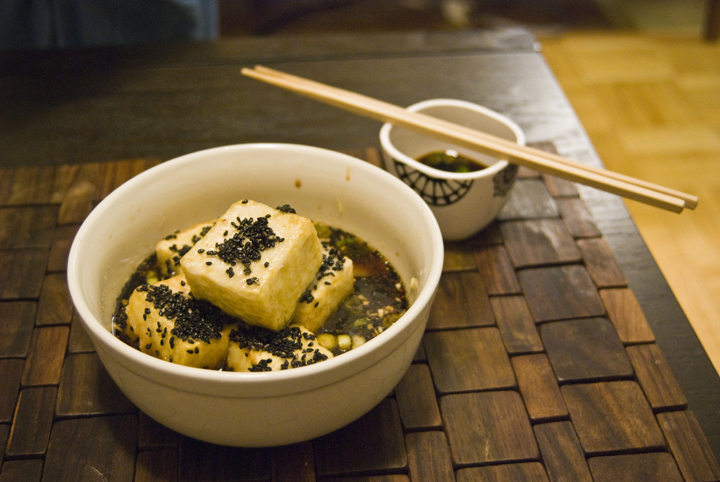 Once the coated tofu is browning, add the sesame seeds, tossing again so that the tofu is coated. Fry for a few minutes after the sesame seeds have been added so that the sesame seeds cook and stick firmly to the tofu. to avoid spending an hour on this post, i'm just going to say what's in each layer and leave the rest up to your capable imaginations. the night before, open the beer and let it go flat. dissolve yeast in 1/4 c warm water. let sit a few minutes until it smells yeasty and looks a little foamy, then stir in the molasses and mix. add flours and salt, mix. add oil and beer and mix to form a not-too-sticky dough (i had to add another 1/2 to 1 c of flour) and knead for 10 mins, until somewhat spongy. place dough in oiled bowl, cover with warm damp cloth, and let rise 45 mins/until doubled in size. punch down and divide into 2 or 4 loaves (i didn't and my loaf turned out monstrously huge!) and place on oiled baking sheet. score twice on top of each loaf with knife, then let sit covered another 45 mins/until doubled, while oven preheats to 350. bake 30 mins. fry the ginger until slightly brown. add the chick peas and sautee until chick peas are lightly browned. add the greens, and when they've cooked down add the tofu. stir around until the tofu is warmed, then add the lemon juice, s/p. while the noodles cook heath the oil in a large stock pot. cook the mushrooms (if fresh) until tender then add the cabbage. meanwhile simmer the broth and add the ginger, garlic and crushed red pepper. because I used dried mushrooms I added them to the broth and let them rehydrate instead of saut%C3%A9ing them. add the cabbage/mushrooms to the broth. simmer until the cabbage is tender and the broth flavor has intensified. then add the tofu, carrots, soy sauce, ringer, sesame oil and mirin. once the flavors have blended and you like the taste add the cooked soba noodles. enjoy. Meanwhile, fry the halved plantain and red bell pepper strips in the canola oil and Earth Balance on medium heat. Cook the plantains for about 5 minutes, until almost cooked through (some blackening okay); place on towel to absorb oil, and then cut in chunks. Fry the red bell pepper strips until soft and starting to blacken, perhaps a couple minutes more than the plantains. Separately, in olive oil, saute the onion and garlic. After a couple minutes, add the chili sauce and oregano, and saute a few more minutes. Next add the plantain chunks and corn, and saute again for a few minutes. Then add the cooked rice, and stir, adding more chili sauce if you like. Add salt and pepper to taste. Turn off heat and then stir in vinegar, lime, cilantro. Serve rice topped with the blackened red bell pepper strips. preheat to 325. line/oil 12 c of muffin tin (i recommend reusable silicon liners). mix flour, powder, soda, salt. then add applesauce, oil, milk, extract, zest, and stir until batter is smooth. fold in blueberries. bake 22 mins. Boil 3 cups water and add 1 cup wild rice, along with 2-3 bay leaves, 1-2 tsp red pepper flakes, 1-2 tsp olive oil, and salt and pepper. Cover and cook. 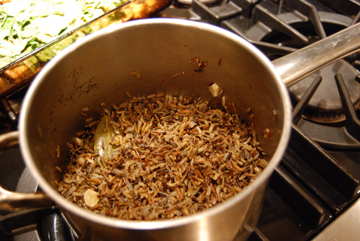 15 minutes before the wild rice is done, add chunks of garlic to the pot. I used "quick-cook" airboat-harvested wild rice, which takes only 20 minutes to cook and can be purchased for about $6/lb at the 2605 London Rd Holiday gas station in Duluth, MN. Cultivated wild rice is cheaper, and hand-picked is more expensive, but they all taste good. Cook the rice sticks per the directions (mine were frozen, I cooked them in boiling water for about 5 minutes, then drained). On medium heat, saute the onion, garlic, and ginger in sesame oil. Once the onions are about cooked (~3 minutes), add the rice sticks. After a minute, add the mushroom broth and hot chili oil. After another minute, after most of the water from the broth has evaporated, add the vegan oyster sauce. Stir and cook until a couple sides of the rice sticks are starting to brown. Then add the basil, stir, and cook for one or two more minutes. Sprinkle fresh lime on top. saute the onion, garlic, fennel seeds, and red pepper in the olive oil for 5 minutes or until onions are soft. add the tomatoes, 2 tbsp basil, oregano, and let simmer for 5-6 minutes. season with salt & pepper and add the rest of the basil. in my experience, the most common way to prepare plantains is slicing and pan-frying. this is a lower-fat alternative based on preparation of a certain kind of banana found in southeast asia that gets really sweet when steamed. i boiled water in a pot, sliced the peeled plantain in thick slices into a steamer basket, and let them steam until each slice was tender all the way through--just a few minutes. the longer they steam the sweeter they get. eat them plain as a snack, seasoned with sea salt (brings out the sweetness), sprinkled with brown sugar, or tossed with lightly seasoned beans, grains, and/or veggies. this time i added beautiful organic red chard to the pot to steam with the plantains, waited until both the chard and the plantains were intensely colored, and used them to liven up some leftover black beans and quinoa, along with a sprinkle of sea salt. note: steamed plantains do NOT make good leftovers because they get very slimy. Peel and halve the plantains. Fry over medium-high heat in the Earth Balance and canola oil, flipping once, for about 3 minutes on each side (you should not cook the plantains all the way through, as they will cook more in the stew). Remove, dab off excess oil, and cut into ~1 inch chunks. Saute the onion in the olive oil on medium heat. After a couple minutes, add the garlic. After a couple more minutes, add the plantains, chickpeas, and tomatoes (including the juice). Add the spices to taste. Once you think it tastes good, cover and reduce heat to low. Simmer for 15-30 minutes, stirring occasionally. 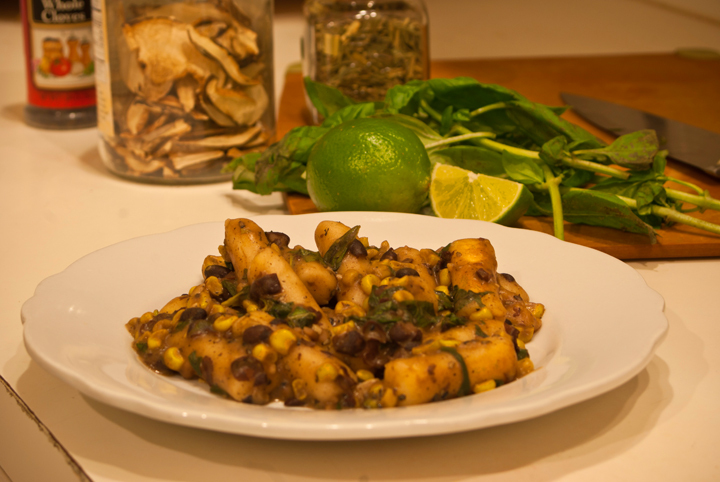 The more you simmer, the tastier it gets (but don't simmer so long that the plantains totally disintegrate). Taste again, adding more spices if desired. Add the coconut milk, raise heat to bring to a boil, and then reduce heat to low again and cover. Simmer for 10-20 more minutes. Then stir in the cilantro and lime, and turn off heat. Serve over the rice with extra cilantro and lime wedges. Serves 4 good eaters, or 8 wimpy eaters. Soak rosemary and thyme in about 1 T of olive oil for at least 10 minutes, preferably more. Combine sundried tomatoes and hot water. Let seep for at least 10 minutes. Remove tomatoes and mince, saving the tomato-water. Stir yeast with warm water. After a minute, add the maple syrup. Stir and let sit for at least 10 minutes (should foam). In a large bowl, combine the flours and seeds. To the yeast-water-maple syrup mixture, add the sundried tomato water, the rosemary with olive oil, the remaining olive oil, and salt. Stir all these wet ingredients together, then stir into the flours. Stir with a fork until the standing liquid is gone, then mix with hands. Add more flour or water if it is too dry or sticky (should be just wet enough that it does not stick to your hands). Knead for about ten minutes. Then coat with a thin layer of olive oil, cover with a damp towel, and put in a bowl to rise (preferably in a warm place, such as on top of fridge) for about 1 hour. After the first rise, knead again for ten minutes, folding in the sundried tomato and garlic, and splitting into two loaves. Shape and put dough in two bread pans coated with olive oil and corn meal. Let rise in the baking pan about 30 minutes. After the second rise, make a cut or poke holes in the top of the loaf, and bake for 10 minutes at 425. Reduce heat to 350 and bake for another 35-40 minutes. Combine dry ingredients in a large bowl. Cut in Earth Balance (with knife or by mixing in with your hands). In a separate small bowl, whisk the corn starch, maple syrup, and 1/4 c soy milk with a fork. Add this along with the remaining soy milk to the dry ingredients and stir, leaving some lumps. 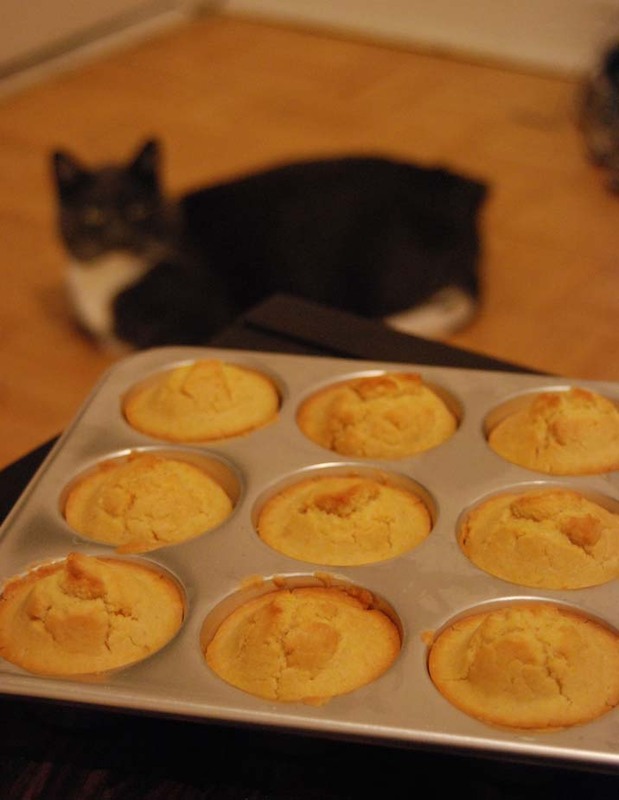 Pour batter into muffin tins or cake pan. Bake at 400F for 20-25 minutes, until the top is just starting to turn brown. 1 chipotle pepper from canned chipotle in adobo, chopped small. Ingredients in case you want to try to make chipotle in adobo yourself: chipotle peppers, tomato puree, paprika, sugar, salt, onions, soybean oil, distilled vinegar, garlic, bay leaves, oregano. handful of cherry tomatoes, halved if small and quartered if big. Any form of diced tomato would work. Roast the sweet potato chunks in a bit of the olive oil at 400F for about 25 minutes, until tender. In a saucepan, briefly saute the garlic and chopped chipotle in about a T of oil. 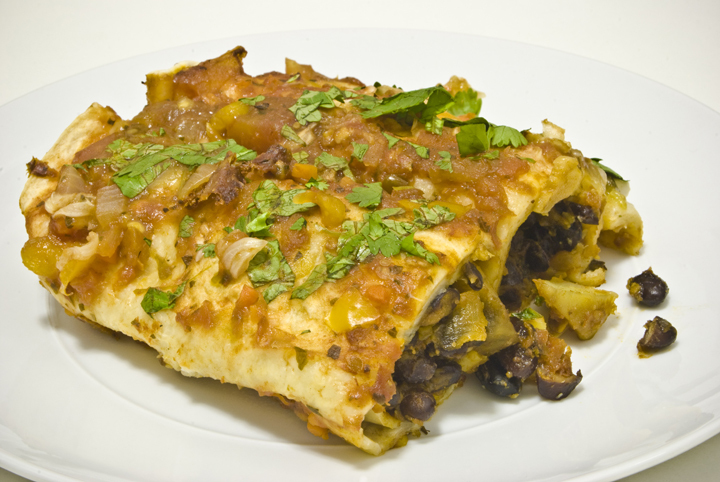 Once fragrant, add the adobo sauce, beans, 1/2 c salsa, tomatoes, and salt and pepper to taste. Saute for about 5 minutes. Lay each tortilla on a flat surface and add a couple big spoonfuls of the filling (it's okay if it seems like less filling than you'd want in a wrap... you eat this more like a casserole and the extra tortilla is tasty). Roll into a narrow cylinder. Add about 3/4 c salsa to the bottom of a lightly oiled 9 x 13" baking pan. 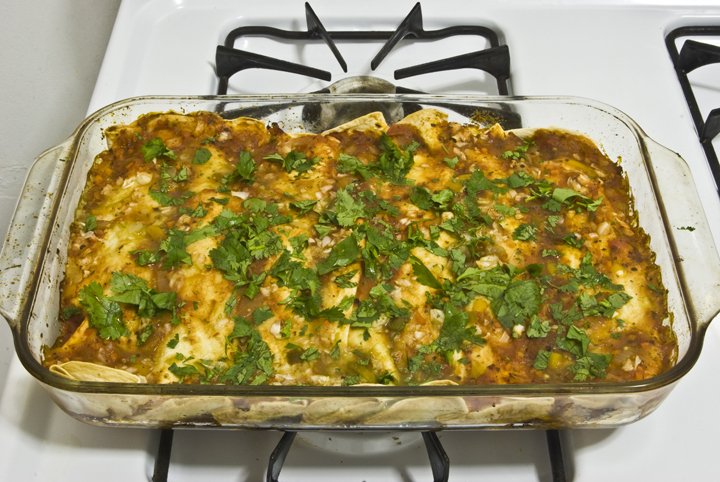 Add the enchiladas side-by-side. Top with the remaining 3/4 c salsa along with the onion. Bake at 350F for about 30 minutes, until it is browning and bubbling. Check halfway through to see if it looks dry, and if it does, add more salsa to the top. After removing from oven, sprinkle cilantro and squeeze the juice of the lime on top. i used a mixture of cornmeal, cumin, s/p. as a dry rub. i usually don't bother with a cornstarch or whatever liquid because rubs tend to stick on tofu really well anyway. then i just fried them in a little bit of oil. 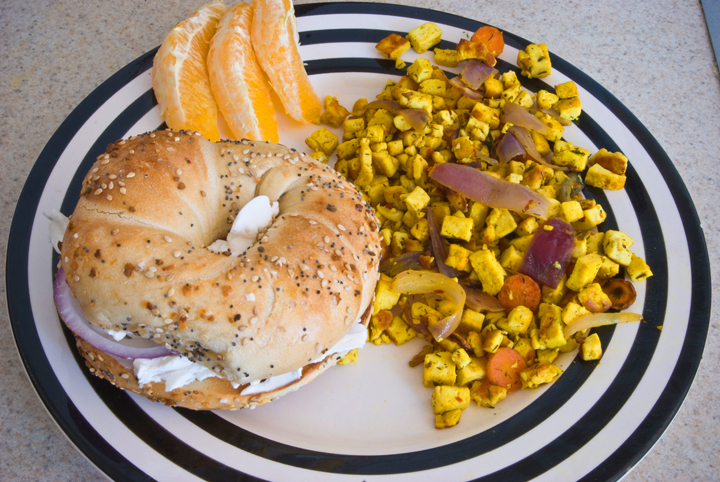 Whenever I make tofu scramble, I am very hungry (it's usually like noon after sleeping in on a weekend and I'm starving), so I just sort of frantically throw stuff together. When it turns out well, I don't really know how to replicate it. This one turned out really good, and this is as much as I can remember; I'll try being more exact the next time I make it. Saute onion, garlic, and carrot with a bit of olive oil, crushed red pepper, a big pinch thyme, cumin, sea salt, and black pepper. Only use as much olive oil as you need to saute these, as we're going to add Earth Balance later. Once the onion and garlic are cooked or just starting to brown, add the tofu with a bit of Earth Balance (use just enough Earth Balance to keep everything from sticking; just using olive oil would be okay too). If it gets dry later, add more Earth Balance. After the tofu is added, add enough turmeric so that everything turns slightly yellow; don't add too much because it will taste weird (probably 1/4 tsp total). Add a dash of ginger; don't go crazy with this either. Add cayenne based on how spicy it has gotten from the red pepper flakes. Add dill; dill is really good in this, so don't be too scared of it. Add Bragg's... mine has a spray top, but I imagine I added about 2 tsp. If using soy sauce, don't add very much (you don't want to taste soy sauce.. you just want it to round out the flavor). Once all these are added, let cook for a few minutes on high heat with minimal stirring so that the tofu really browns on a few sides. Add a splash of vinegar when it's close to being done, along with more salt, pepper, and/or Earth Balance if it needs it. Cook the udon (use oil in the water so it doesn't stick). After cooked and drained, run cold water through the noodles (also to prevent sticking). Mix all the other ingredients. Toss the cold udon in the mixture. Cook udon according to directions (mine cooks in boiling water, to which I add some sesame oil and ground pepper, for 10 minutes. After cooking I run cool water through to keep it from sticking and from continued cooking in the strainer). Saute onion and garlic (add garlic a few minutes after onion) in a bit of sesame oil until slightly brown. Combine the rest of the ingredients in a bowl, stirring thoroughly. Add the sauteed onion and garlic to the sauce. Coat the noodles in the sauce. Thank you for your interest in Unibroue and its products. In response to your inquiry, we are happy to attest that no animal ingredients are used in Maudite or in any of our beers (except for Honey in our U Miel brand). in the food processor, pulse equal parts pitted black olives and cooked white beans (i used great northern), plus capers (optional, i didn't use any), garlic, and lemon juice to taste (i tended towards the heavy side with both, to good results). add a dash of olive oil and blend until smooth. 1) combine 1/8 cup of the very warm water with the yeast. add the maple syrup and stir until the yeast granules are dissolved. set aside for about 10 minutes then add in the remaining warm water, olive oil and salt. 3) combine the dry ingredients and the wet ingredients. knead the dough for about 10 minutes and transer to a lightly oiled bowl. cover the boil with a damp dish towel. let the dough rise for at least an hour. 5) bake at 425 for about 10 minutes and then reduce to 350. bake for another 25-30 minutes. to tell if you loaf is cooked knock on the bottom of the loaf. if you hear a hollow sound it is done. never cut into hot bread! Once cool, add a dash of soy sauce (you don't want to actually taste soy sauce; it just helped round out the flavor), lemon juice until you can just taste it, vinegar to taste, sriracha or hot sauce to taste (optional), cherry tomatoes, and scallions. in a sauce pan, heat the oil on medium heat. saute the garlic until it starts to brown. then add the tomatoes, 3/4 of your chopped basil, sugar (if you use it), salt and pepper. reduce the heat to a simmer. cover and let cook for about 20 minutes. at the end add fresh basil and toss over the zucchini.